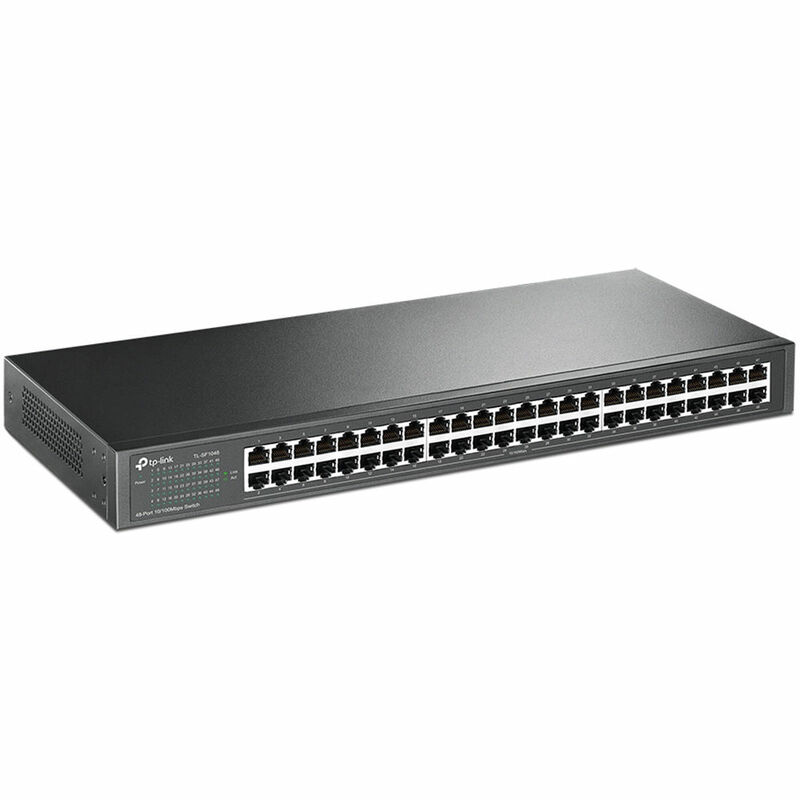 Boost the switching capacity of your small business with the TL-SF1048 48-Port 10/100 Mb/s Rackmount Switch from TP-Link. Equipped with 48 Fast Ethernet ports, the unmanaged TL-SF1048 has a switching capacity up to 9.6 Gb/s and a forwarding rate up to 7.14 Mpps. Housed in a rack-mountable 19" steel case, the plug-and-play switch boasts energy-efficient technology that's designed to limit its power consumption by up to 50%. This switch is designed to automatically adjust its power consumption according to link status and cable length, ideal for limiting the carbon footprint of your network. It also complies with the RoHS standards, which prohibit the use of certain hazardous materials. Up to 80% of the packaging material can be recycled. Featuring non-blocking switching architecture, the switch forwards and filters packets at full wire-speed for maximum throughput. IEEE 802.3x flow control for full-duplex mode and backpressure for half-duplex mode helps to alleviate traffic congestion. This plug-and-play switch features auto MDI/MDIX, which eliminates the need for crossover cables. Auto-negotiation on each port senses the link speed of a network device and intelligently adjusts for compatibility and optimal performance. Box Dimensions (LxWxH) 21.0 x 10.1 x 3.1"